1. NPT Makes Connections: You’ll perform elbow-to-elbow with our professional Broadway, Film and TV pros. 2. NPT Creates Experiences: You’ll take conservatory-level classes as a part of your rehearsal experience. 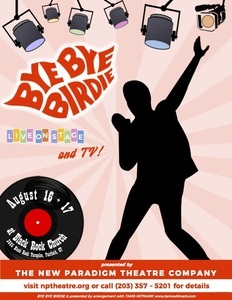 This year we focus on Film, TV, commercial and technical work as our version of Bye Bye Birdie will have live camera work woven throughout the show! 3. NPT Mentors Leaders: You’ll learn more than just how to become the next Broadway star. Learn the skills you need as a young leader through the work we do with our social justice partner non profits in the community. * Young people of all abilities, ages 8-18 years, may apply. Adult auditions to be announced at a later date for NYC and CT.
Any student who registers by January 28th will be giving $100 off of the full tuition. Any TEEN who registers by January 28th will be giving $100 off full tuition and will be chosen for the chorus of NPT’s collaboration with Norwalk Symphony Orchestra on Feb 23rd of West Side Story!